An attack on a group of travellers results in the death of almost everyone involved. Watching most of the group get killed, young Shinta thinks to protect 3 young girls in the group. Akane, Kasumi and Sakura however have other ideas protecting young Shinta with their very lives. Shinta, facing sure death is spared by the arrival of Hiko Seijiro, a lone swordsman following the Hiten Mitsurugi Ryu school of swordsmanship. After saving young Shinta, Seijiro tells the young boy to accept the deaths as there is no way to bring back the dead. Death was an all too common event in Edo Japan during the Bakumatsu. The year is now 1864, and young Kenshin walks the night streets of Kyoto in search of his nightly victims. One of Kenshin's victims, Kiyosato Akira, despite being severely injured struggles to live on, and ends up cutting Kenshin on his cheek. Young Kiyosato's last thoughts before dying is on his young fiancee. Young Kenshin finds that following every assignment thereafter, the cut on his cheek bleeds as a reminder from someone who had been killed by Kenshin and as a reminder of someone who's future had been destroyed as well as the happiness of those around him. The Hiten Mitsurugi Ryu school of swordsmanship is for protecting people; and young Kenshin is wondering if his killing people on a nightly basis is truly helping to protect people. Memories from before becoming a hitokiri plague Kenshin. His parting with his swordmaster Hiko Seijiro and the reasons for Kenshin wanting to leave the mountain where he learned to wield a sword and his last words with his master are fresh in Kenshin's mind. Kenshin is especially reminded of Seijiro's words, that the art of the sword is the art of murder; and this disturbs him. Truly all he has been doing has been killing people. 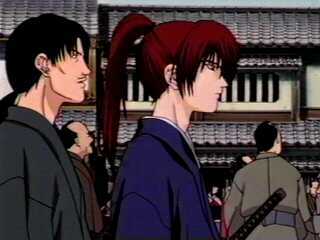 The memory of when Kenshin was first approached by Katsura provides a counter to his memories of Hiko Seijiro. Katsura suggests that in order to bring in a new era, one must first destroy the old; and to do that, one may therefore need to kill others. When asked if he would be able to kill people to bring about change, Kenshin decides to join Katsura as a hitokiri to try and serve the greater good as he saw it. Young Kenshin, during an ambush on the streets in Kyoto, meets young Yukishiro Tomoe. Tomoe, a young lady who had been drinking alone in an Izakaya greets the young swordsman saying "Anata honto ni furasuno desune; chi no ame" (you truly bring it down; bloody rain). This is the first of the Kenshin OAVs focussing around the history of Kenshin and his (first) wife to be, Tomoe. Based on the Bakumatsu period of unrest in Japanese history, this series proves to be quite violent and bloody and very depressing. Given the nature of Kenshin's history as hitokiri Battousai, we find that there is alot of killing and death in the series, most often in a cold-blooded manner. The killing is not fueled by hate or anger but rather because of necessity and of following orders from higher up as a means of bringing about change in pre-Meiji Japan. The first thing to strike viewers is the incredible detail in the picture. The animation is truly beautiful and the scroll rate is quite good; much stronger animation than seen in the TV series let alone the movie. The incredible detail in the backgrounds gives the viewer much to focus on. Likewise the music is also beautiful concentrating more on string instruments and orchestrals to bring about a hauntingly melancholy feel to the OAV. Because of this focus on bringing about such a melancholic feeling to the OAV, there is little emotion shown in the voice acting; rather the characters are detached, concentrating more on getting through the nightly work and dealing with business. The more emotional scenes are reserved for the flashbacks regarding Kenshin's training and eventual parting with Hiko Seijiro.